President Obama to be Removed from Arizona’s Ballot for 2012 Election? 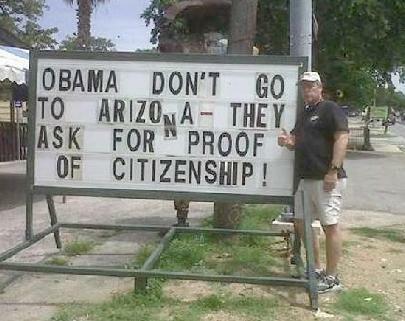 *Arizona is serious about their racist-ness! They must feel like they’re racism hasn’t been heard loud enough in this generation since they declared not to celebrate Martin Luther King day as a federal holiday so many decades ago. Next ArticleCop Kills Honor Student and Makes Cop of the Year?! What makes the whole situation MORE crazy(as if that was even possible) is Arizona also wants to see President Obama’s CIRCUMCISION CERTIFICATE! Who the hell has a circumcision certificate- I have 4 sons and was NEVER given such a document. So many in our country continue to have a “Master” attitude. Its bad enough they want the POTUS to show “his papers” now they want to know about his d**k. Those Tea Nutters have some sort of Mandingo thoughts going on in their heads.